With the Straits of Malacca and Andaman Sea which leads into the Indian Ocean on the left, as well as the South China Sea bordering the Pacific on the right, Malaysia is never short of produce from the vast oceans. In fact, none of the states are landlocked, so seafood is always in abundance and with that comes a myriad of ways of preparing it. 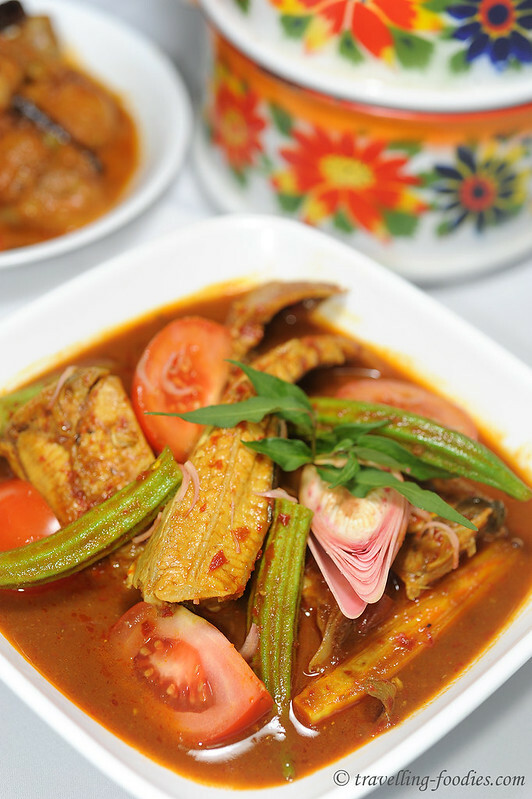 Asam Pedas is one of the most popular way of cooking fish, as tang and heat marry the delicate and sweet flavours of white meat so well. The highlight of the Johorean version is the incorporation of bunga kantan (torch ginger flower) and daun kesum (vietnamese mint) were used which I suspect to be common within the Riau region which includes the Johor sultanate, Singapore and the Riau Islands as well as parts of northeastern Sumatra. 5-8 branches of daun kesum (Vietnamese mint), looped into a knot. 1. Heat wok and add oil. Saute rempah paste over medium heat until oil begins to separate. 2. Add serai and bunga kantan halves and strained asam jawa water. Bring to a boil. 3. 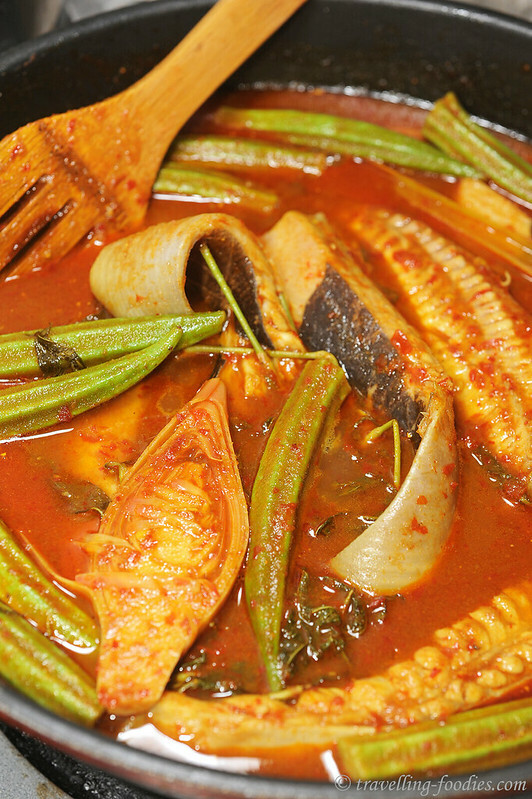 Add daun kesum, followed by stingray chunks. Add salt and sugar and top up with more water until it covers at least 3/4 of the fish. Bring it back to a boil. Let it simmer at medium low heat for about 2-3 min. 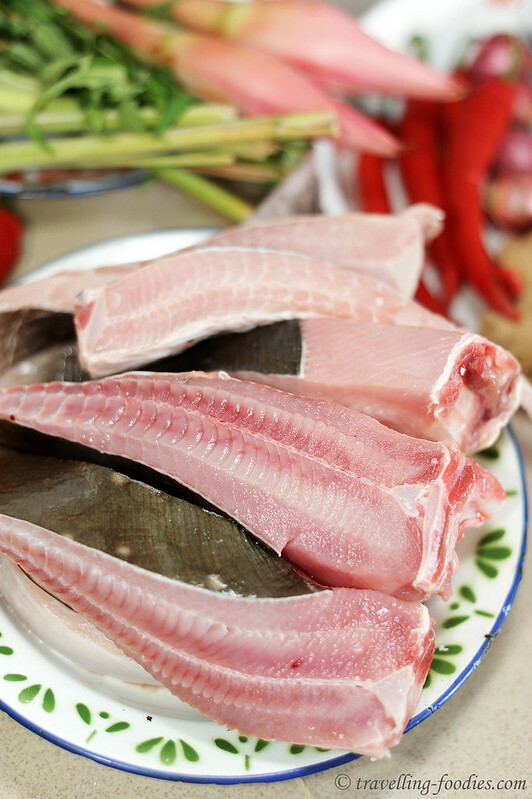 Sting ray is cooked when it can be flaked easily. Adjust taste with more salt or sugar if necessary. 4. Add okra and let it cook for 1 min. Add tomatoes, give it a light toss and turn off the heat. 5. 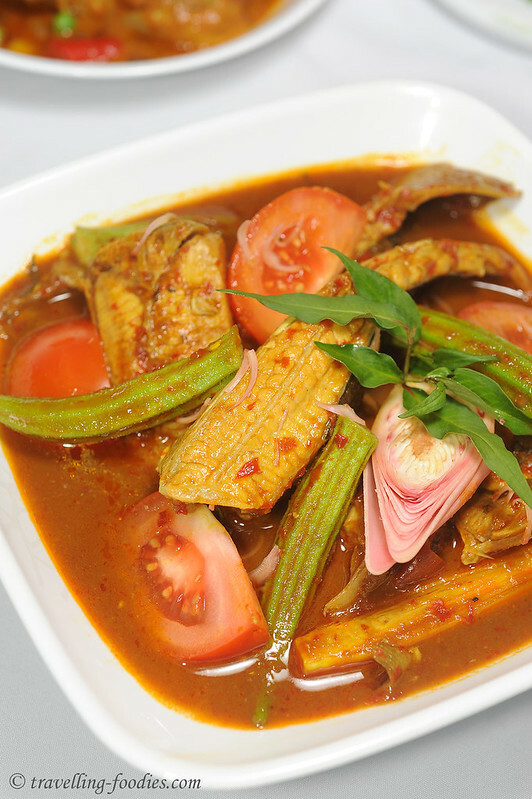 Dish up, garnish with slices of bunga kantan and daun kesum. Serve with rice. This entry was posted on March 11, 2013 by Alan (travellingfoodies). 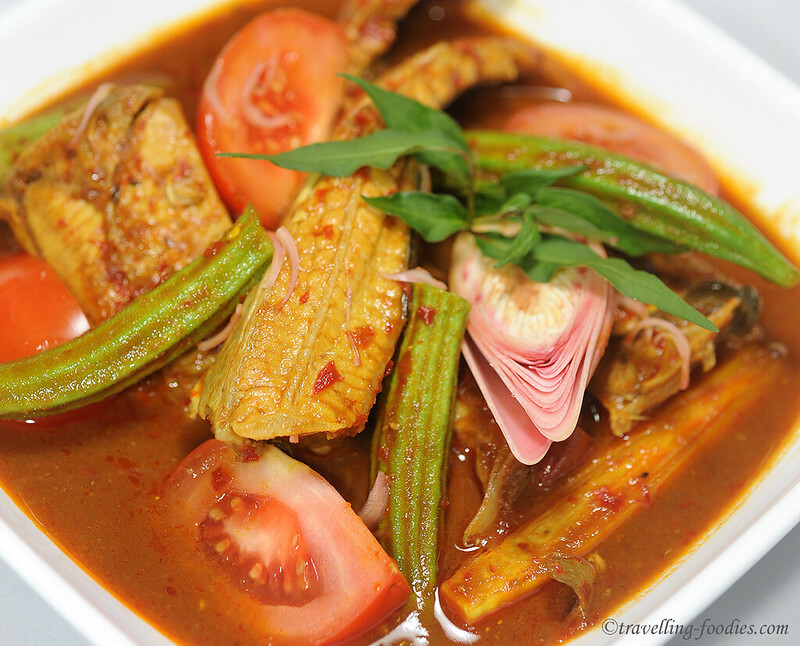 It was filed under Food, Simple Eats and was tagged with asam jawa, asam pedas, bendi, bunga kantan, chilli, cili merah, daun kesum, ikan pari, johor, lady's finger, laksa leaves, malaysia food fest, sour, spicy, stingray, tamarind, tomato, torch ginger blossom, vietnamese mint. Assam stingray! I love this dish! Whenever we eat out at any “Point Point Rice” stalls (This is how my kids describe the “Mixed Vegetable” rice stalls as we always point through the glass panel to indicate what we want.. haha), I would order this if available. A must-have for me at any Nasi Padang place. Is that the size of ricebowl which is about 200ml each?